Wondering why your knees, ankles, wrists or fingers snap, crackle, and pop? The jury is out on the definitive reason why this occurs and is unlikely to come in with a verdict any time soon. One reason is the ligaments are stretching over a bone and slipping back in place. Second is the compression of nitrogen bubbles in the spaces of the joins and then the refilling of the joint with synovial fluid, which lubricates your joints. A third reason they could be popping is due to friction between the muscle/tendons and the bone. Tight muscles/tendons make this more likely to happen. A fourth reason is called joint fixation. 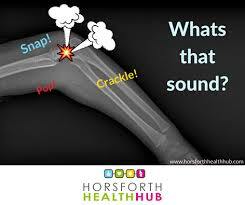 This is when the bones of a joint become stuck together due to suction and when the seal is broken you hear a pop. You can tell the difference between friction and fixation by the reoccurrence rate of the popping. Fixation takes time to set up, so it won’t repeat with every bend of the joint. Friction on the other hand will repeat each time you bend the joint. Everyone has popping joints at one point in their life or another. In most cases, there is enough slack in our tendons and muscles that no harm is done. Although the sound of it can be irritating or concerning, there is nothing to worry about injury wise. You’re not causing damage and it doesn’t mean that there’s an injury. You should be concerned about a pop is if it causes pain or swelling because it can indicate a tearing or rupture of a tendon or even a fracture of a bone. You will likely know if it could be something like this because there will be an event that causes it. If there is swelling and pain try rest, ice, compress and elevate. If that doesn’t help after three or four days or if the pain is serious(painful to use for normal daily activities) and there is significant bruising, see your doctor. If the popping is driving you crazy, there are some things you can do to try to reduce or banish the popping. First, try some stretching of the tendons and muscles around the area where the popping is occurring. Stretching should be done when the muscles are warm and not to the point of pain only tightness. Be gentle with yourself. Hold a stretch for 20-30 second and repeat the stretch 2-3 times. Try some yoga. Yoga not only stretches those muscles and tendons, but can be quiet effective at building balance and strength. Staying active will also reduce the popping and snapping. You don’t need to sit around because you’re all creaky and poppy (I think snappy is a better way to describe it-just more positive). Continuing to stay active actually increases the lubrication of your joints. So you can tell all those nay sayers who ask “Isn’t running bad for your knees?” No it’s not. As a matter of fact, it’s good for them. You can direct them to this article or just tell them to take five minutes and google it on their smart phone. Cracking your joints or a ongoing unintentional popping of your joints won’t cause your joints to get bigger and it doesn’t cause arthritis.